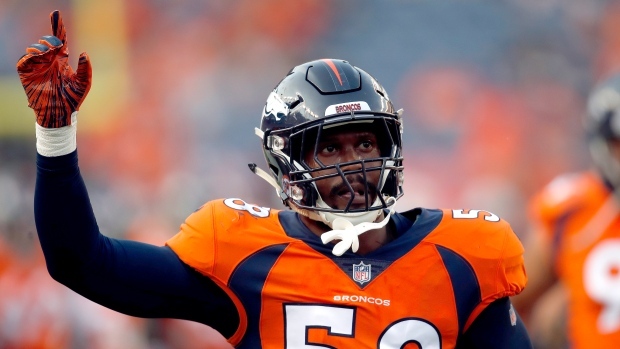 NEW YORK — Julius Peppers, Von Miller and Vernon Davis are among the 32 nominees announced Thursday for the NFL's Walter Payton Man of the Year award. The Man of the Year is honoured for outstanding community service off the field as well as excellence on it. It was established in 1970 and renamed in 1999 for the Hall of Fame running back. "The Man of the Year Award gives us the opportunity to acknowledge 32 exemplary players whose commitment to excellence extends on and off the field," NFL Commissioner Roger Goodell said. "This year's nominees have used their platforms to transform communities across the country. We are proud of their work and celebrate their dedication and impact through this award." A total of $500,000 will be donated in the name of the 2018 recipient, with $250,000 going to Character Playbook, the NFL and United Way's digital character education program. An additional donation of $250,000 will be made to the charity of his choice. The other 31 finalists will receive a donation of $50,000 in their name to expand Character Playbook, and an additional donation of up to $50,000 to their charity of choice. All donations are courtesy of the NFL Foundation, United Way Worldwide, and Nationwide, the presenter of the Walter Payton Award. "There's nothing like being able to make a difference amongst those who are seeking empowerment and those who yearn to be inspired," Davis said. "If I can encourage our youth to explore and do whatever it is they aspire to do, from painting to playing the flute, that fills my heart with joy and motivates me to do even more. Making a change one day at a time is what I live for." Jets nominee Kelvin Beachum was awed to be connected with Payton. "It's a tremendous honour," the offensive tackle said. "Just the name Walter Payton, he's the gold standard. What he did off the field and on the field, his excellence is bar none, top in history. So to be mentioned in the same name and the same breath as him, it's truly humbling." The five current players who have won the award — Drew Brees, Thomas Davis, Larry Fitzgerald, Eli Manning and J.J. Watt — wear a Man of the Year patch on their jerseys. All 2018 finalists will wear a Man of the Year helmet decal beginning this week through the end of the season. "Being nominated for Man of the Year is an accomplishment," Falcons defensive tackle Grady Jarrett said. "Giving back and making an impact on people's lives in a real way is very important to me."